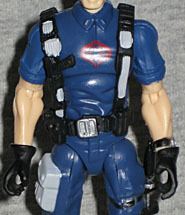 By this point, Hasbro's GI Joe line has released over 1,400 individual figures. It's pretty surprising, then, that they can somehow still manage to find G1-inspired things to release that we've never had in toy form before. Flint was a Rhodes Scholar and earned his degree in English Literature. Bored by the Groves of Academe, he enlisted in the Army and applied the tenacity and concentration he had used so well scholastically to grind his way through Airborne School, Ranger School, Special Forces School and finally Flight Warrant Officers School, graduating each with top honors. A thorough tactical planner, Flint drafted and personally led a half dozen rescue missions in hostile territories that for obvious reasons of security were never publicized let alone admitted to. Yes, that's the same bio from the first G3 Flint, not at all specific to this figure. The quote at the bottom of the card, however, is new: "I needed to get inside a Cobra base. Heavily guarded. Teeming with troopers. A frontal assault wouldn't work. So I 'persuaded' a trooper to loan me his uniform and went right through the front door. The rest, as they say, is history." Go Flint! We weren't originally going to review this figure - it's just a collection of old parts, really. The bulk of his body comes from the Cobra Trooper, with the redone arms from Tiger Force Duke. Yes, it's a nice figure to own, but does it really need a review? Maybe. 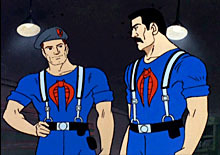 Flint in Cobra Disguise isn't just something Hasbro made up to sell toys: he (and Mutt) actually donned the Cobra blues in the "Revenge of Cobra" miniseries - specifically, in the second and third episodes. Remember, this was the "Weather Dominator" story, so if you got that DVD box set, Flint will add some meat to the diorama. Now, granted, there are some clear differences between the cartoon artwork and the actual toy - the old Sunbow animation wasn't exactly hyper-detailed, you know? His web gear is more ornate, and has different colors: it's more black than gray, and has better definition on the pouches. He's also wearing black gloves, which the animated version wasn't. But honestly, are changes like that going to bother anyone? Flint's still using the too-thin face that the previous G3 releases have sported, which is disappionting. I know this is this series' "profit maker" - if all the figures in a series sell for the same price, but one costs less to make than the others, its sales mean a bigger profit for the company. Got it? Now, if there's a figure that costs more to make than the average toy in the series, the two will even out. So this fully re-used mold is helping to make up for some of the recent extravagant toys. Still, would the cost of tooling a new Flint head have really broken the budget? If you don't want this figure to be Flint, you have that option: Hasbro included a replacement Cobra Trooper head, complete with a removable helmet. This is the same head used on all the other Troopers (other than Scar-Face, of course), and the same helmet, too. The mask is black, as they all were on the tv show, and he's even been painted with some black hair under the helmet - it matches Flint, so if you want to pretend it's still him behind the bandana, you can. 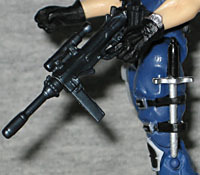 Flint gets all the Cobra Trooper's usual accessories: a knife and a gun. The knife is the giant one that straps to his leg, while the gun is the same kind that came with the Crimson Twins. Why that, rather than a realistic rifle? Because that's what the troopers in the cartoon were armed with. Good attention to detail! Hasbro is treating the Cobra Trooper like the GI Joe equivalent of Star Wars' Clone Trooper: the guy they can churn out with minor cosmetic changes and make a fast buck off collectors. But hey, is that such a bad thing? It used to be there was only one Trooper and one Officer: now we've got lots of "generic" troops, each with their own specialty. If you don't want this to be Flint, the rolled-up sleeves still make this Trooper look unique. Maybe he's a repairman, or a computer technician or something. Maybe the air conditioning's broken at the Terrordrome. Who knows? Either way, this is a good toy, even if it is everything we've seen before.